Sciblogs | Is the Waikato River really one of the cleanest rivers in the world? Is the Waikato River really one of the cleanest rivers in the world? Recently, Jacqueline Rowarth (professor of agribusiness at the University of Waikato and newly appointed Chief Scientist for the Environmental Protection Authority) declared that the Waikato River is one of the 5 cleanest rivers in the world in terms of its concentration of nitrate and that the river’s nitrate concentrations have improved due to changing farming practices. 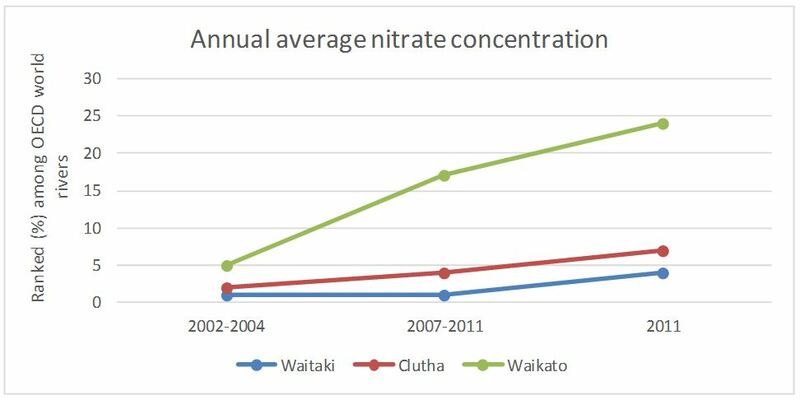 This statement contradicts Environment Waikato’s data showing the river’s climbing nitrate concentration, which concerns many freshwater scientists including Environment Waikato’s Bill Vant. Recently, NIWA’s Bryce Cooper, and others freshwater scientists have spoken out to the media and criticised Rowarth’s statements. Dr. Doug Edmeades (a soil scientist) subsequently wrote in the NZ Farmer in support of Rowarth’s analysis and questioned the integrity of the freshwater scientists who presented data contradicting Rowarth. Subsequently, Rowarth wrote a letter to the NZ Farmer stating that faecal bacteria (E. coli) levels in the Waikato River would pass the European Union’s standards for swimming (NZ Farmer, Oct. 26, 2016). Rowarth’s and Edmeades’ statements contain factual errors, use outdated data and misrepresent the current state of the Waikato. The New Zealand Freshwater Sciences Society (comprising over 400 freshwater scientists and professionals) would like to set the record straight concerning the condition of the Waikato River and the comparisons made by Rowarth to OECD river nitrate levels and the European Union’s (EU) microbiological standards for swimmability. “The Waikato River doesn’t even make the top 30 cleanest waterways in New Zealand”: Regarding Rowarth’s statement that the Waikato River is one of the 5 cleanest rivers in the world, comparisons with a small selection of the world’s rivers for which data were provided to the OECD does not provide any basis for her statement that the Waikato River is the one of the 5 cleanest rivers in the world. As Dr. Bryce Cooper pointed out, “the Waikato River doesn’t even make the top 30 cleanest waterways in New Zealand”. Here, Rowarth has committed a basic statistical error in equating the Waikato River’s ranking among a small sub-sample of world rivers for it’s ranking among all the world’s rivers. OECD data used were from 2002-2004. New data show a rapid deterioration in nitrate concentrations: Rowarth’s analysis concerning nitrate concentrations was based on OECD river nitrate data from the years 2002-2004 (these data are now 12 to 15 years out of date). We have looked at these data, as well as the OECD’s most up-to-date river nitrate data (for around 100 rivers up to 2011). The data in the OECD world river database show that Waikato River nitrate levels have deteriorated rapidly relative to the OECD sample of world rivers, dropping from its 5% ranking in 2002-2004 to a 24% ranking in 2011 (Fig. 1). This large drop in the Waikato River’s ranking occurred over a period of only 10 years. If this trend continues, by the year 2025, the Waikato River will be no cleaner than the average river in the OECD world river database. This information contrasts starkly with Rowarth’s and Edmeades’ messages, that the Waikato River is one of the cleanest rivers in the world and that farming practices are contributing to improvements in water quality in the river. Figure 1. The percentile position of three New Zealand rivers in relation to rivers in the OECD database, based on annual average nitrate concentration. Data from OECD. Number of rivers in 2002-2004 = 88; in 2007-2011 = 73; in 2011 = 100. Misunderstanding of statistics regarding E. coli concentrations: Rowarth’s statement that the Waikato River’s faecal pollution indicator (E. coli) levels would pass the European Union’s standards for swimmability is in error because she erroneously equates two different statistics of E. coli concentration (the median and the 95th percentile). The median concentration is similar to the average concentration whereas the 95th percentile is closer to the maximum concentration. So she erroneously compared the median concentration of E. coli in the Waikato River, which she mistakenly interpreted as the maximum concentration, with the 95th percentile in the EU standards (1000 cfu/ 100 mL) for swimmability. Comparing apples and oranges like this is nonsensical. Analysis of Environment Waikato data for 2009-14 shows that E. coli levels in the Waikato River at Huntly failed bathing standards as defined by both the EU and by our National Policy Statement for Freshwater Management. Rowarth’s and Edmeades’ comments seem oblivious to the large, government/ iwi/ stakeholder/ community Waikato River restoration project now underway: Rowarth’s and Edmeades’ misrepresentations of the condition of the Waikato River in relation to rivers in the OECD database and to EU microbiological standards distracts from the fact that the river has been identified by central government, regional council, a variety of stakeholders, iwi and local communities as being in need of restoration. Funds have already been allocated and collaborative processes are underway to try to improve water quality in the lower river to a swimmable standard again. Rowarth’s and Edmeades’ comments concerning the condition of the Waikato River are not only false, but distract from the important work being done to improve water quality in New Zealand. They are not freshwater scientists, and this is reflected in the poor standard of data analysis and interpretation. The publication of such poor scholarship in media outlets does not foster robust debate; rather it can serve to confuse and distract the interested public and non-experts. To help avoid such problems in the future, the New Zealand Freshwater Sciences Society encourages the media to consult its members whenever non-experts attempt to address freshwater issues publicly. This post has been adapted from NZFSS material. Featured image: Wikimedia / QFSE Media. I can’t believe an apparent expert could be so backward. Why do you think a former Professor of Agribusiness was selected to head the Environmental Protection Authority? A very enlightening and disturbing article. Disturbing because the person demonstrating these basic errors in scientific analysis, and cheer-leading existing farming practices, is now the chief science advisor for the Environmental Protection Agency. It’s difficult to reconcile how this could be the case. Neither Professor Rowarth nor the EPA will have credibility if she does not admit her egregious errors, and retract her statements. Does anyone know if the restoration project mentioned is implementing the use of mycelium as a filtration barrier for waterways through farm land? Research shows it has been successful in almost completely ridding waterways of ecoli in the states. Well done team – many thanks. How on earth did we end up with an EPA Chief Scientist with such poor understanding of one of NZ’s key indicators of environmental health, and an apparent serious bias towards agriculture? What I find disturbing is that neither Jacqueline or Doug have responded to this article. Surely scientific discussions like this are never properly finished without a response. Readers have a right to know of these people feel they have been misinterpreted or misrepresented in any way and if they have a comeback to the points made in the article. Are we to interpret their silence as a concession? In my opinion this is a very sad article. Sad because – we don’t actually know what Prof Rowarth said. She was not directly quoted, there is no transcript of her presentation. Only a news article where the journalist has possibly, I would suggest probably paraphrased and not accurately represented the point made – as has been inferred by Rowarth in subsequent articles. Why would the NZFSS need to rebut this? Rather than rebut, he has reinforced, before entering an analysis of the OECD data of his own. An analysis that is of great concern to me. Dr Marc Schallenberg’s analysis of more recent data includes data that is based on a different data set. As he has pointed out the 2002-2005 data was based on 88 data points. The 2011 data set is based on 100 data points. Data sets that are different sizes. And from that his has inferred a trend. Dr Marc criticises comparing apples with oranges, but in my view hypocritically does it himself. Not only that Dr Marc Schallenberg has presented a graph that shows 3 yr rolling averages for 2 data points then a 2011 data point. On a graph. Again apples with oranges. To add to that, Dr Marc Schallenberg presents a line graph, where the horizontal axis could mislead the reader. I think this graph would be more better represented as a bar graph. In my opinion this is poor presentation of science. I am surprised to see behaviours like this from a Doctorate, as, in my experience this type of behaviour is discouraged at very low levels of education. So what we have here is an article where Dr Marc Schallenberg has tried to rebut comments by Prof Rowarth. In my opinion all he has muddied the waters further. It saddens me as I think all of this behaviour undermines the real discussion. What is the state and trend of water quality, should it be improved and if so how should it be improved. I would remark on Rowarth’s statements – but to be as clear as I can be, I don’t know what they are. The lack of transcript and quotation means it is impossible to have an informed view. Yet we have this article. I am sure there is more to come from this story. I look forward to the Councils analysis of Nitrate levels in the River. No doubt they have a role in clarifying public conceptions. No doubt they have a role in this debate. I note that LAWA report the Waikato TON as ‘indeterminate trend’ over the 2006-20015 period. In other words there is no significant trend over this period. Those of us who rely on scientists and other experts to critique statements on matters of fact and science on contentious public issues are very grateful to all who take the time to read and critique those statements and to make this information available to us. Thanks NZFSS for critique and subsequent discussion. Given the role of the EPA, rigorous science is a must – and we must have confidence in the person who directs the science processes. On the bar graph v line graph, fixed point samples can well be bar graphs, and continuous lines where a time series is available with many data points. Given that the data presented is in fact a sets of aggregated data over several sets of dates, the choice of which way to portray the data is reasonable either way. It is hardly a sign of dereliction to choose one rather than the other. Thanks for the work NZFSS and the very clear radio interview by Dr Marc Schallenberg. If these people recognise the knowledge of science, maybe they should be more scientific in their approach towards this planet we live on. WRC said it was a crock of cow poo and these NZ farmers counteract by presenting one solitary opinion with a non-existent sample size???? The lack of transparency here indicates the lack of authenticity… NZ’s ‘clean green image’ is dead because of people like this who think they are so high and mighty that they don’t need to change. I asked Professor Rowarth to provide me with the data upon which she relied. She sent me the OECD data-base summarizing water quality data from 98 rivers around the world and also referred me to the Waikato Regional Council report on the quality of the water in the Waikato River. I reviewed the data and came to the conclusion that her interpretation of the OECD was correct. It was also consistent with the conclusion reached by the Morgan Foundation. I examined the Waikato Regional Council data and concluded: “Taking a very broad perspective, their most recent report covering the period 2003 to 2012, shows improvement in some indicators (Ammonia N, Total P, BOD, Arsenic, Chlorophyll and E coli) and deterioration in others (Turbidity, Clarity and Total N). Based on this information the Waikato River Authority gave the river a C grade pass. I recorded these facts in my fortnightly column to the NZ Farmer. Dr Schallenberg seeks to minimize the OECD suggesting that it represents “a small selection of the world’s rivers.” This is possibly true if you counted all the rivers in the world but I suggest that 98 of the world’s important rivers is not trivial. Further he says that the OECD data “were from 2002-2004.” This is incorrect. Some of the records commenced in 1980 and went to 2003 others longer. Others cover the period 1990 to 2011. Dr Schallenberg states that “the Waikato River nitrate levels have deteriorated rapidly. This is not consistent with the Waikato Regional Council’ data. Dr Schallenberg states that “The Waikato River doesn’t even make the top cleanest waterways in New Zealand.” This of course is irrelevant to the proposition that the Waikato River is one of the top rivers internationally. Or, accepting this to be true, it means that there must be many rivers in NZ, which are good shape. It is true that I did not refer to specific sites – there are 10 – along the Waikato River. That is why I prefaced my comment with “Taking a broad view ……” This comment is put in context of the Waikato River Authority’s assessment. Dr Schallenberg suggests that my comments “…..distract from the important work being done to improve water quality in New Zealand.” For the record I support the Health River initiative noting that it is now in the public domain and there are some important issues that need debate, discussion and resolution. I would have thought that placing the quality of the Waikato River into the international context, and rejoicing in that fact, will greatly hearten the many farmers who will now be required, mostly at their expense and effort, to make changes on their farms, to improve the quality of the Waikato River. Pushing into the headwind of doom and gloom, alarmism is much more difficult that racing ahead with the tail wind of objectivity and hope.